Purpose: Use this document as a reference for recalculating a third party contract in ctcLink. Local policy/process will determine how often third party contracts should be recalculated. 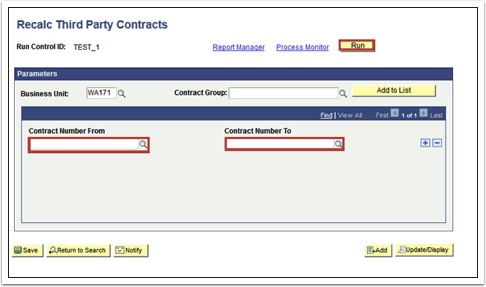 Enter an existing Run Control ID or lick the Add a New Value tab and create a new one. Enter the Contract Number From and Contract Number To. Click Run button and then the OK button. Continue with the Running Reports process.